From concept to completion, an authentic learning event takes good planning, a huge investment of time and lots of work. The good news is that once you've experienced an authentic learning event from planning to performance you've learned a new process and it makes the next event a little easier to navigate. Its interesting, but in my experiences I've noticed that as my learning curve increases so does my student's engagement level. It's as if my excitement in learning and learning new things is directly transferred to my students. There is another advantage of teaching using this education model. Teachers have lots of opportunity to develop their skills and learn new things in developing authentic learning events. If you're a focused, motivated learner, and you're students observe this, then you're modelling exactly what they need to become better students themselves. Students love that genuine approach. ​Another great benefit in completing a successful authentic initiative is "the words now out". Other teachers, parents, community members and experts will understand the context and impact of your authentic initiative and be more willing to contribute to the next event. It's at this point where you'll understand there's a whole plethora of possibilities and the world's been waiting. A common parent and community response I consistently receive is "Why don't more schools do this type of learning?" And they are right! ​It's very important to understand that the examples I've included on this site are refined events that took shape over time. When I implemented my first egg drop experiment it was like many, a one off activity. It was completed over a day and it didn't have the signature four weeks of connected curriculum or design back criteria. It was the seed. It was an experiment for me as well. Take small steps, refine, consult redesign and plan for a more complex event next year. Start with simulations or project-based challenges, then move into the authentic. I urge all educators to seek collaboration in creating authentic initiatives. If not a teacher at your school, then perhaps another teacher in another school. With today's Skyping and FaceTime communication, teachers in other parts of the country or other countries for that matter can be included. It's important that all stakeholders have been consulted. Students, parents, administrators, teacher colleagues, community members, custodial staff and any other skill providers are all contributors that will make your authentic learning event a successful one. Those teachers who provide subjects other than you to your students can make fantastic collaborators in enhancing the student experience. For instance in French it's an excellent way to spend time on Latin based words when you're immersing your students in ancient Rome. Learning and playing medieval recorder pieces in music is a great compliment to a medieval authentic learning event. The possibilities are endless! Generally speaking, I've used a pyramid of planning scheme (seen left) when designing my events. Each event requires a clear goal (tangible product) but planning for success, to reach that goal means developing a solid foundation. It doesn't matter what event is being created, this general planning model can help you achieve success. Many of my authentic learning initiatives came to me when I was away from the school environment. It really became my own interpretation of "out of the box". Seeing new things, traveling and introducing myself to new technologies always kept my imagination flowing. It also reflects how important the environment is in nurturing creative thought and I always tried to bring that to my students in some form or other. It's wasn't just the product they were designing, it was the environment those students were immersed in that really created those contagious, creative sparks. Immersing students in classrooms that were going to be transformed into something exciting was a big incentive. We always kept our eyes on the prize. Watching a plan come together in concrete ways, just as we planned it, was always exciting. As we worked down the check list of things to do, the students became even more empowered and focused and this positive energy gathered real productive energy. I've included a planning template for an Intermediate Level (Canada) Middle School (USA) that I've used to support planning for an authentic initiative. I've also included an idea matrix that provide examples of authentic learning initiatives across the grade spectrum. Below is a typical web planning chart I use when starting an authentic learning event. Although I usually start my planning out on napkins, chart paper or note pads, I've created this one into an easy-to-read display to clearly see my subject integration plan. 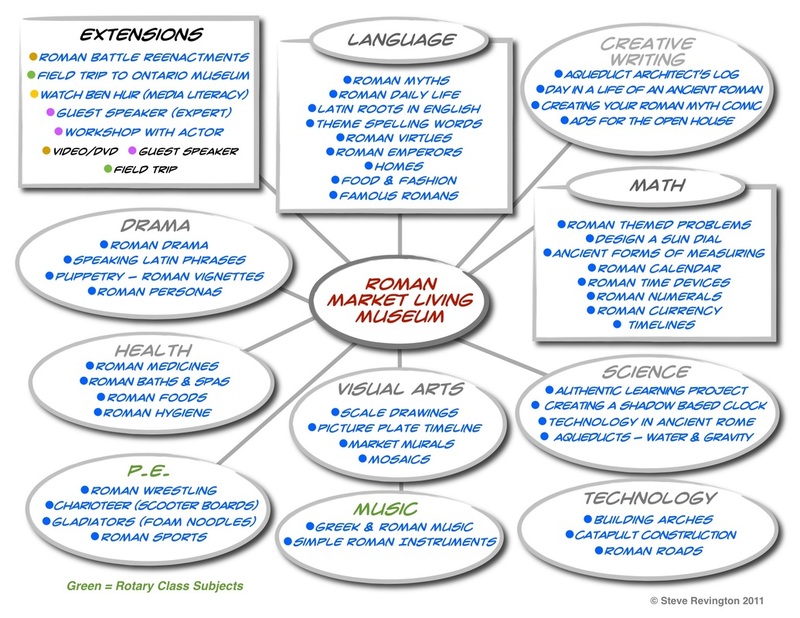 This is an example of one year's Ancient Roman Living Market Museum plan but each time, depending on availability, opportunities, time restrictions, physical or personal limitations the plan can be different. 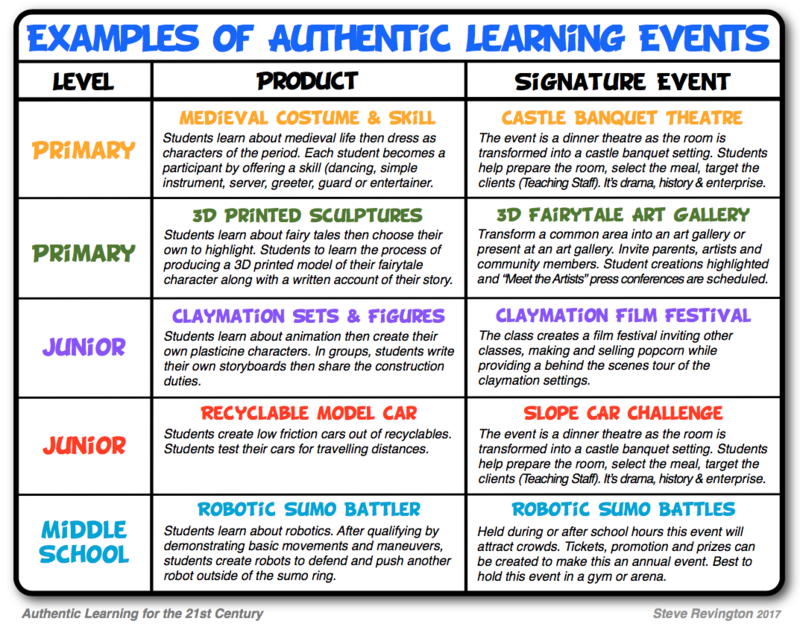 Authentic learning is learning by creating a tangible product which has real world applications. What goes into preparing it, is what will make it a successful product in the end. Once you have an idea of what you'd like to do, its imperative that you can clearly define what the product is and try the idea out on others. Remember that the higher the skill level of those you consult, the more integrity your authentic unit will have. Here's a sample list of questions that may need to be considered by the teacher and especially the students to initiate the project. Teachers, students, colleagues and community must work together to develop a successful plan. Personally, I prefer the students to come up with as many questions as they can. What is the game concept going to be? Is there a niche (market) for this concept? How many connections can be extracted from the curriculum? What do most successful board games for this age look like? What materials does one need to create their own prototype? How are board games manufactured? What do most board games for that demographic look like? How are game boards packaged? How are board games marketed? How can one be sure that the new game(s) work? What kind of themes, colours and interest are children interested in today? What about working with earth-friendly materials? What are some of the greatest game board successes? Is there a history of board games. How are we going to present them and to whom? When's a good time to introduce the games and market them? What kind of expertise do I have at my disposal? Where and how can we get professional development? How will we integrate our subjects? The success of the board game, when publicly presented, is directly related to the quality of planning and workmanship that went into the board game's production. Authentic Goal: To design and create a commercially viable math problem board game. Please Note: As in real life, things happen. Flexibility, timing, read and react qualities all will come into play. There will be market changes, design alterations, personnel changes and a variety of hidden challenges await. When your students observe your abilities to skillfully manage all of these, a higher education comes into play. You are their model for success. You don't have to have all the answers, but you should know where you can look for the answers. Remember, it's the process that counts. Event success all comes down to realistic event expectations, appropriate resources, a realistic, flexible schedule, quality skill sets and community support.